By far my favorite thing to cook when I was little was Ronnie Rooster’s Cinnamon Toast. I got this recipe from my very first cookbook: The Happy Pixies’ Cookbook. The recipe was exactly what one might think it would be, but I still followed the directions – carefully pre-heating the oven, placing white bread on a cookie sheet, smearing each slice with softened butter (this was pre-microwave, when butter had to be softened by leaving it out on the counter and then…waiting), sprinkling with brown sugar and then sprinkling again with cinnamon. In just a few minutes under the broiler I had perfectly toasted, buttery, sugary delights! I made the Ronnie Rooster Cinnamon Toast all the time and often tried different takes on it. If we didn’t have brown sugar, I found that regular sugar worked nicely as well. If you lightly toasted the bread without anything on it first and then added the butter and toppings, the heat of the toast would help to melt the butter and you didn’t have to wait for it to soften on the counter. I even got a little indulgent a few times and did a second layer of butter/brown sugar/cinnamon and re-toasted. Sometimes getting a recipe right is like working your way through a maze where the dead-ends are just dishes that aren’t yet perfect. And, even though I had strayed from the original recipe, I always kept the book out while preparing the toast. Everyone has her own comfort food – the one thing she craves when feeling down. For me, that was always Ronnie Rooster’s Cinnamon Toast. There are things you need if you want to create in the kitchen and there are things that you just don’t really need anymore. I gave away almost all of my cookbooks last year as part of the downsizing of my life. If I need a recipe, I can find it online. Actually, I can find 1,000 variations in most cases. And, living in a small apartment, I love that the Internet doesn’t take up any physical space. I know by heart how to make Ronnie Rooster’s Cinnamon Toast. 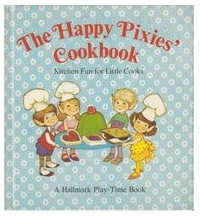 And yet, when recently sorting through what to keep and what to give away, I decided to keep my tattered copy of The Happy Pixies’ Cookbook. I like knowing that there are always happy pixies in my kitchen.